CDA Blog > What’s the Nation’s Favourite Quality Street? Sharing a tub of Quality Streets on Christmas Day is an age-old tradition for many families during the holiday period. However, it’s not always as pleasant as it sounds, especially when you go for that after dinner chocolate and find all that is left are coconut eclairs. The chocolates were only opened a few hours ago so where have they all gone? This Christmas, we decided to get to the bottom of your festive fallouts. We set out to look at whether you’re being left short-changed by Nestle and find out once and for all which family member is stealing all the best chocolates. We surveyed the public to find out what their favourite Quality Street was, and we looked at how many of each chocolate were in a tub of Quality Streets. We then used the information about your favourite quality street chocs to create the best bargaining tool you’ve ever seen: The Quality Street Exchange Rate. Check out what we’ve been up to below. The Purple One – The chocolate coated caramel goddess with a nutty centre. The Green Triangle – A milk chocolate triangle with a deliciously smooth hazelnut praline centre. The Coconut Éclair – A milk chocolate sweet filled with coconutty goodness. Milk Choc Block – A solid chunk of pure chocolate. Toffee Finger – A soft toffee stick wrapped in milk chocolate. Toffee Penny – A coin shaped smooth toffee sweet. Caramel swirl – A round chocolate filled with caramel delight. Fudge – Soft and sweet vanilla fudge coated in a layer of milk chocolate. Strawberry Delight – A beautiful soft centred chocolate filled with strawberry cream. Orange Crème – Dark chocolate sweet filled with a soft orange cream centre. Orange Chocolate Crunch – A shapely milk chocolate sweet indulged with an orange tint. Honeycomb Crunch – A chocolate truffle infused with a honeycomb treat. What chocolates do you get in a tub of quality street? Let’s see how the amount of chocolates you get in a tub compared to what you actually want. While the order of the nation’s favourite sweets differs slightly between the survey we carried out of people’s favourite Quality Street chocolates and Nestle’s own poll, 4/5 of the chocolates in the top 5 were the same. It’s safe to assume The Purple One, Green Triangle, Strawberry Delight and Caramel Swirl are the most popular chocolates that people want to see in their tubs. You might expect to see more of these chocolate in the tub then… well not necessarily. Of these top 4 chocolates, only one of the chocolates correlated with the top five most common chocolates in the tin, and this was the Strawberry Delight. In actual fact fudge which was the most common chocolate in the tin was 7th out of 12 in our popularity results. The coconut éclair, with 8 chocolates, was one of the most common in the tin, yet this was 11th on the nation’s favourite list only topping the new and controversial honeycomb crunch. So, are Nestle leaving you feeling short-changed? Well two chocolates that you get more of in the tin, our poll suggests you don’t actually want. The Green Triangle and Caramel Swirl, two of the nation’s most favourite chocolates, are actually the scarcest chocolates according to what we found in our tin. Ok that’s not good, but who’s stealing which chocolates out of the tin? We broke the nation’s favourite chocolates down by age and gender, and it turns out most people’s favourite chocolates are the Green Triangle and The Purple One. The Green Triangle is more favoured by the young adults but once you reach middle age, the Purple One edges into the lead. With both chocolates having a nutty twist however, it’s perhaps interesting that these two sweets get crowned top of the Quality Street chocolates. There isn’t much favouritism for the orange chocolate crunch until you reach the 65+ age group when it reaches the top 5. If these are missing from the tub, I’d cast an eye in nannan and grandad’s direction. Interest in the milk chocolate block falls with age, with the 65+ age group rating it as their least favourite Quality Street, even below the new honeycomb crunch. No one really likes the coconut éclair either but if you’ve really trying to pinpoint a chocolate thief, it won’t be the 18-24. They wouldn’t go near the coconut éclair if it was the last choc in the tin. If the strawberry delights are missing sooner than you hoped, don’t look at your grandparents. This chocolate is in the top 5 for every age group apart from the 65+ when it drops to a lowly 8th. The fudge tends to waver as a middle choice chocolate, something people opt for when all their favourites have sadly disappeared, however if you’re struggling to find a fudge, I wouldn’t blame the parents. People aged 35-44 rank the fudge 10th, even below coconut eclairs. The 35-44 age group would be very disappointed with the chocolates we found in our tin as they were more fudge and coconut eclairs than the other chocolates. The orange chocolate crème tends to be a middle choice chocolate like the fudge however for the 18-24 age group it falls to 10th place in their rankings. Our table ranks each age groups favourite Quality Street chocolate so if you’ve only got certain chocolates left in the tin, use our image to pinpoint your culprit. Don’t worry if your favourite Quality Street has disappeared however because this year, we at CDA are coming to the rescue. We’ve created the Quality Street Exchange Rate. 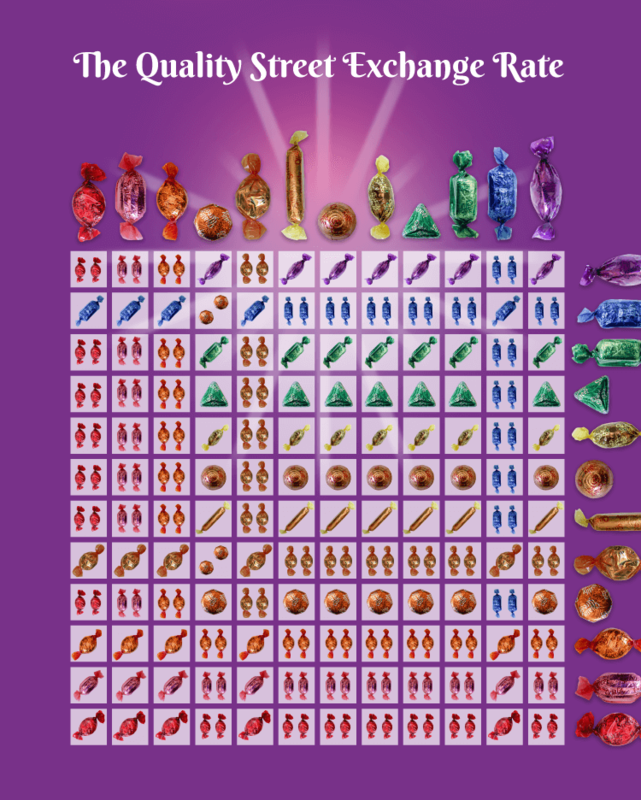 It tells you exactly how much each chocolate is worth so if your mum’s stole all 8 strawberry delights you can use this chart to find your bargaining tool. It’s likely to cause less arguments than stealing your mum’s stash while she’s putting the turkey in the oven. Find your culprit and use our exchange rate to start negotiations. This Christmas, take back your chocolates.